Halloween is a festival that takes place on the 31st of October. It happens every autumn. The story of Halloween goes all the way back to ancient times. For the Celts who lived in Britain and Ireland at that time, New Year began on November 1. The night before, a festival was held to mark the change from summer to winter. Because October 31 was the day the sun was at its lowest, it was believed that the sun entered the underworld for a short time, and, while the gates of the underworld were open, evil spirits were released to roam the Earth. To frighten these spirits away, the Celts lit huge bonfires and dressed up as witches and ghosts. Today most people do not believe in ghosts and witches, but it's fun to dress up as one for a costume party. In the United States and Great Britain schools have parades of children in costumes. Ghost, witch, cat and skeleton costumes are popular with many children. Parents help their children to make their costumes. 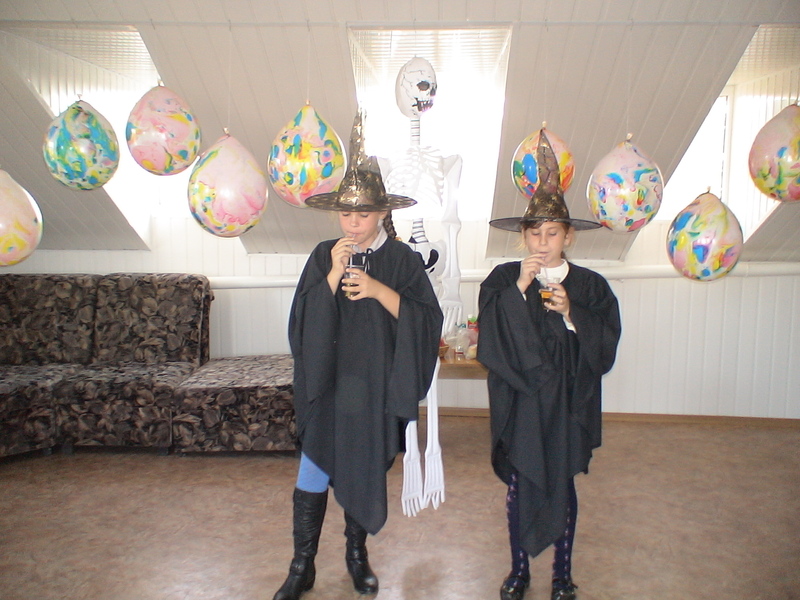 Many classes have Halloween parties. 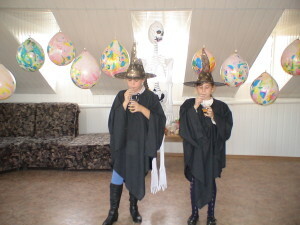 The main Halloween activity for children is trick-or-treating. Children dress in costumes and masks and go from door to door saying “trick or treat”. Most people give them such treats as candy, fruit and some money so that children do not play tricks on them. Many families carve jack-o’-lanterns out of pumpkins. Usually people carve scary pumpkin faces. But some people carve funny or happy faces. They place pumpkins in the windows or on doorsteps. “Haunted houses” for children are also popular. A “haunted house” may have paper ghosts hanging from the ceiling. Scary music may be playing in it. Ghost stories may be told at the “haunted house”. Fortunetelling is an important part of Halloween. There may be a “fortune-teller” who pretends to know the children’s future. Teeth ground sharp and eyes glowing red. Fingers like snakes and spiders in my hair. Everyone hails to the pumpkin song. Here in a flash and gone without a trace. Filling your dreams to the brim with fright. In our town of Halloween. Everyone’s waiting for the next surprise. Make you jump out of your skin. This is Halloween, everybody scream. Don't forget that the most important part of Halloween is to have as good a time as possible! Эта запись написана автором Елена Шрамкова, 18.10.2015 в 15:07, и размещена в категории Halloween Time, Традиции и обычаи Великобритании. Следите за ответами на эту запись с помощью RSS 2.0. Вы можете написать комментарий или разместить обратную ссылку на своем сайте.